A new report published by Conflict Armament Research (CAR), an organization based in London that investigates the flow of illicit weapons around the world, reports that even though Armenia has been formally aligned with the EU arms embargo on South Sudan since 2011, a group of Armenian-flagged aircraft began transporting government army (SPLA) personnel and equipment within South Sudan in 2014. The CAR report “Weapon Supplies into South Sudan’s Civil War”, was first published in November 2018. The SPLA (Sudan’s People’s Liberation Army), founded as a guerilla movement against the government of Sudan in 1983, now constitutes the army of the Republic of South Sudan. The government has been engaged in a civil war with the SPLA-in-Opposition (SPLA-IO). Weapons exported from around the world have wound up in the conflict. It shall be prohibited: a) to provide technical assistance related to military activities and to the provision, manufacture, maintenance and use of arms and related material of all types, including weapons and ammunition, military vehicles and equipment, paramilitary equipment, and spare parts therefor, directly or indirectly to any person, entity or body in, or for use in Sudan or South Sudan. The November 2018 CAR report, which presents a comprehensive survey of the sources and mechanisms of weapon transfers into South Sudan’s civil war since the start of the conflict in December 2013, mentions the role of Armenian-registered aircraft in “Section 5 - Domestic Logistics”. 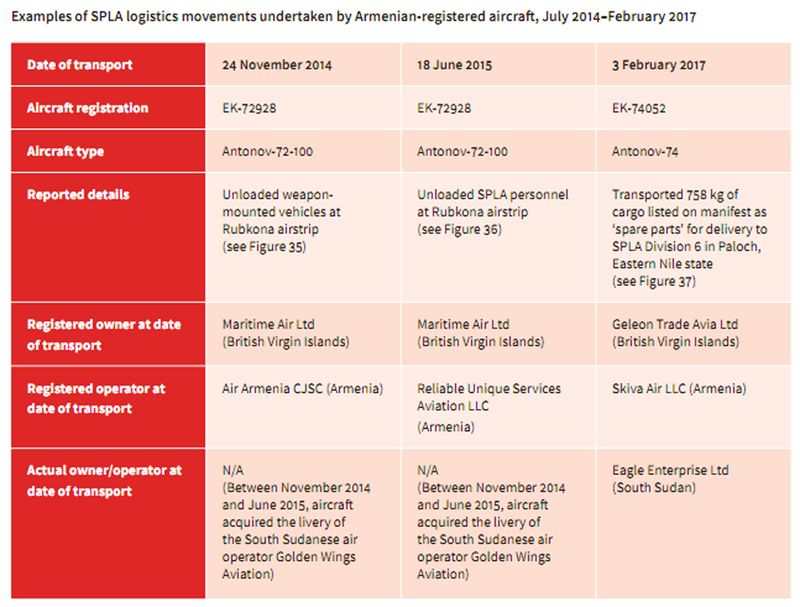 In January 2016 the UN Panel of Experts on South Sudan identified two of these aircraft as SPLA logistics providers.172 CAR has established the actual operators of these aircraft, and further details of their activities (see Table 7); it has also confirmed that at least one other Armenian-registered aircraft has also transported cargo for the SPLA. Following the presentation of evidence by CAR and the UN Panel about the activities of these aircraft, the European External Action Service engaged with the Government of Armenia, which led the Armenian General Department of Civil Aviation to withdraw Skiva Air’s operating licence at the end of March 2017.